I love a bit of crustacean action…except the time when I was aged 8. My mother brought home a seafood feast of blue swimmer crabs, prawns and lobster which we happily tucked into one afternoon, and a few hours later, I broke out in horrendous hives!! But I digress…Thankfully it was just a one off incidence, and so crustaceans still remain heavily featured in my diet. Last night I found myself heading over to the recently opened Burger & Lobster, to see what the hype and queues were all about. From the team behind Goodman’s Steakhouse (supposedly one of the best steaks in London), they’ve certainly stuck by the rules of keeping things simple. There’s no food menu as such, except what has been scrawled on the chalk board, Burger or Lobster. Beef burger, whole lobster, or a lobster roll; all served with fries and salad for £20 a pop. For me, there was only one thing to order, and that was the Lobster. Grilled and served with a side of lemon-garlic butter. But for my friend, a self confessed lobster virgin, as he wasn’t a fan of crab nor the idea of extracting his supper from the shells, opted for the Beef burger. With our Prosecco and delicious cocktail of Gin, Cucumber and Chamomile syrup in hand, our waiter swiftly brought out our meals on silver trays. The accompanying lemon-garlic butter was lacking the lemon tang or the garlic flavour, and it probably could have done with a bit of salt, and a dash of tabasco sauce. My friends burger just looked OK, and probably not worth the money compared with the whole meaty lobster I had in front of me. I’m pretty sure he would have had food envy! Overall, the atmosphere was buzzy, and service was fairly swift once you get through the door, but I’m sitting on the fence with this, and still working out what the hype is about if I’m honest. Yes, it’s definitely good value by London standards, especially for a whole lobster, but for the over-priced burger, the lobster roll (which I didn’t see anyone eating and understand it’s just the claw), and the slight attitude you get from the hostess at the door holding all the power via a clipboard, I’m not sure it’s really worth the 1.5 hour wait?! 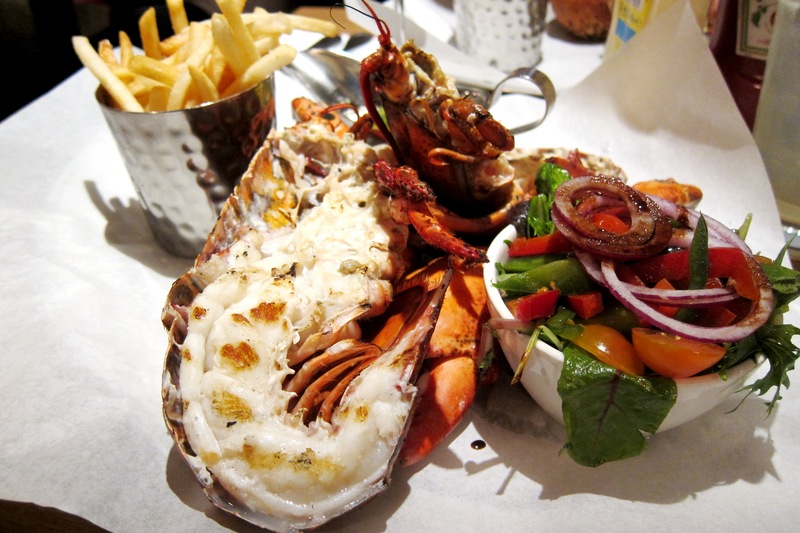 The lobsters are sourced from Nova Scotia (Canada) and delivered to Burger & Lobster three times a week, where they crawl around in a tank in the basement until they are ready to realise their fate. Before the Lobsters are steamed or grilled, they are put into an electric machine called a CrustaStun, which shocks the lobsters into unconsciousness within seconds, one of the only ethically approved method of dispatching lobsters in a commercial kitchen. The lobster roll isn’t just a claw, it’s all of a lobster though a slightly smaller one. It’s delicious.